Center Stone(priced separately): Patented cushion Crisscut white diamond available upon request or complete this engagement ring setting with one of our certified loose diamonds. Diamond Details: Round brilliant cut white diamonds on the sides of I color, SI1 clarity, weighing 1.01 carats total. 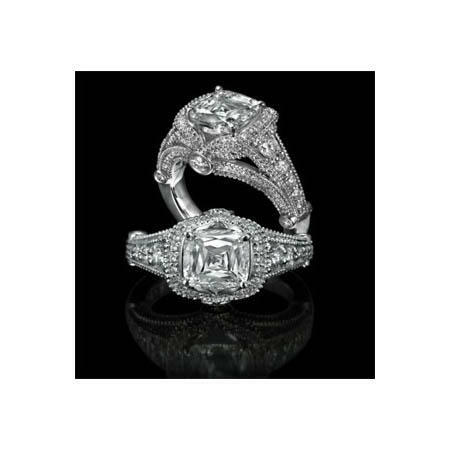 This elegant Christopher design antique style platinum halo engagement ring setting contains 1 patented Cushion Crisscut white diamond, of J color, VVS2 clarity, weighing 2.23 carats, with round brilliant cut white diamonds on the sides of I color, SI1 clarity, weighing 1.01 carats total. Beautiful caviar beading, creates an antique style effect.